I have been battling dry hair and skin and eczema my entire life and unfortunately my young daughter is experiencing the same problem. I am a holistic mama who prefers to use natural hair and skin care products whenever possible but it has been difficult to find naturally derived products that provides enough moisture for our hair and skin. Recently, I have been learning about the benefits of using Baobab oil which comes from the Baobab tree which is known as the “Tree of Life” and can live up to thousands of years. This tree produces the Baobab fruit which contains the oil inside the seeds and has been used by women as a beauty treatment because of its ability to nourish the driest skin and hair. 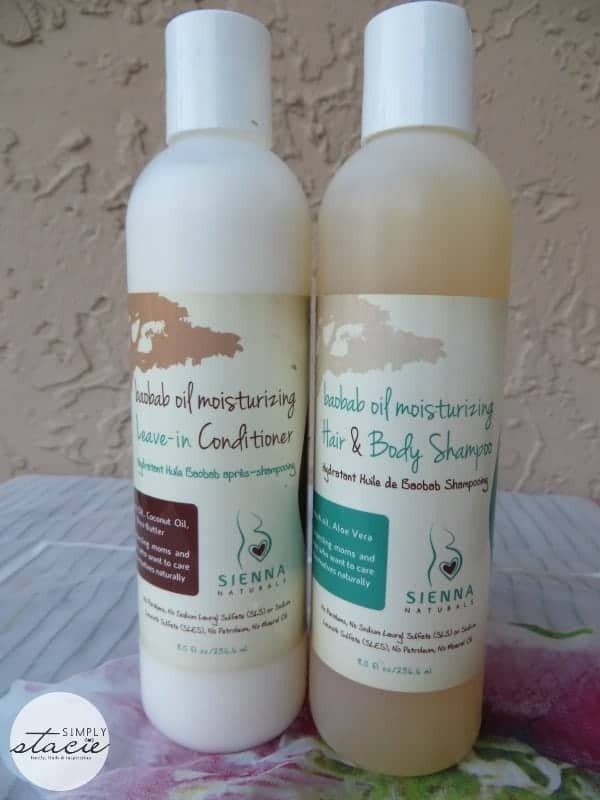 Sienna Naturals has a full collection of hair and skin care products that features Baobab oil and other naturally derived ingredients such as Aloe Vera and Vegetable Glycerine to combat the problem of dry, dull hair and skin. Therefore, this product collection would be perfect for women, children and men who have highly textured and/or dry hair and skin. For our hair care needs, Hannah and I are both using the Baobab Oil Moisturizing Hair & Body Shampoo (SRP $18) and the Baobab Oil Moisturizing Leave-In Conditioner (SRP $16). We both have fine hair that tangles very easily and can break when we try to comb it out after washing. My hair is particularly fragile because it is long and highlighted. What I noticed after the initial use of both this shampoo and conditioner is that my hair was much easier to comb. Hannah was so excited when her comb slipped through her hair and it was honestly one of the first times that it didn’t end up where she was in tears as we tried to get out her tangles. The shampoo has a nice lather and lovely fresh scent but what is does not have are potentially harmful parabens, Sodium Lauryl Sulfate, Sodium Laureth Sulfate, Petroleum, Mineral oil, Pthlalates or silicones. Since many other brand moisturizing shampoos and conditioners were often times too heavy or built up on our finer textured hair, I was a little apprehensive that this might be a problem with this line too. Thankfully, we have now been using it for over two weeks and there is absolutely no noticeable build up or heaviness……instead our hair feels softer, smoother and less frizzy even in the Florida humidity! Another big plus to using this product line for me personally is that I have naturally curly hair that turns into a big puff ball in the humidity and looks awful. When I use this shampoo and especially the leave-in conditioner, I notice that my curls dry so much prettier naturally so I have to use less heated styling products in order to straighten my hair. The Sienna Naturals Baobab Oil Moisturizing Body Cream (SRP $24) is absolutely incredible on our dry skin. Hannah especially reminds me to apply it to her legs, feet, hands and elbows every night before she goes to sleep because it is making a wonderful difference in her dry, eczema prone skin which is itchy and bothersome. This product nourishes the skin with Baobab oil, Shea Butter, natural vitamin E and grape seed oil. It is so rich and creamy without becoming a greasy mess and it literally vanishes in less than a minute into my thirsty skin. I love how it turns from dry, scaly (gasp) skin into shimmering skin on my legs so I make sure to apply it before donning my swimsuit or a dress. This would be absolutely perfect for pregnant mamas to keep their skin all over looking its best throughout their pregnancy and post-partum too. I really recommend this product line for anyone who is suffering from dry skin…..it is just wonderful! You are invited to visit Sienna Naturals to browse the entire hair and skin collection and pick the products that you need most for your particular personal care needs. 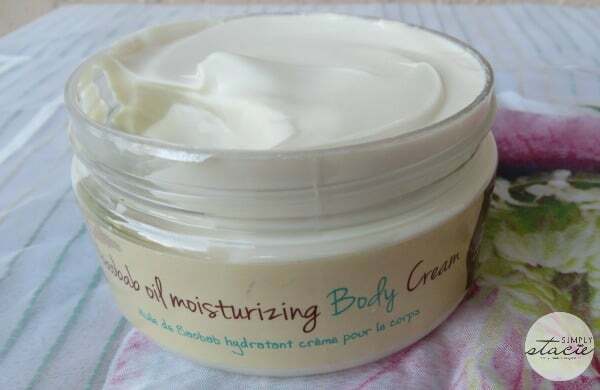 I want to try the Baobab Oil Moisturizing Body Cream. Key ingredients: Baobab Seed Oil, African Shea Butter, Grape Seed Oil, Natural Vitamin E, Vegetable Glycerin, Lavender Oil, Vanilla Fruit Extract. I just love how the ingredients are all natural! Vanilla fruit extract makes it sound like it smells delicious! I like the Baobab Oil Moisturizing Leave-in Conditioner. I really like the Baobab Oil Moisturizing Hair and Body Shampoo. Baobab Oil Moisturizing hair and body shampoo. I really like the Baobab Oil Moisturizing Leave-in Conditioner. I’ve been looking for a natural leave in because all the alcohol and chemicals in regular ones makes my hair so frizzy. i want to try the body cream. the Baobab Oil Moisturizing Hair and Body Shampoo. I think I may love the Baobab Oil Moisturizing Hair and Body Shampoo. Thank you so much for the chance to win it. I learned that their products can improve the skins elasticity! I would love to try the baobab oil moisturizing collection. My wife likes the Baobab Oil Moisturizing Hair and Body Shampoo. This stuff looks amazing! I would love to try the leave in conditioner to help my frizzy curly hair and the body cream looks great too! The shampoo. It’s hard to find a good shampoo for my dry but oily scalp. I’m glad that they make a leave-in conditioner! The leave in conditioner looks fabulous. I’d love to try it. I learned that they do not test on animals that is huge to me. I love their leave-in conditioner. I would love to try the Baobab Oil Moisturizing Collection Set. Thanks for having this contest. Ilike the Baobab Oil Moisturizing Collection 2oz Travel Kit,it would be great for travel. I learned that all their products are manufactured in the United States. I like that their Shea Butter is sourced from women’s cooperatives across West Africa. That give employment to women who desperately need the income.